Just wanted to give an update on our little man Buster! He has fit in with our family since day one. Like Jon said (his former foster father), its like he has always been with us. Buster has all the perfect characteristics; he’s a lover, a snuggle buddy, a huge grunter/snorer (love it! 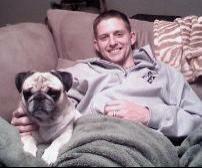 ), a true companion and at the same time a crazy little playful puggy (they don’t call him Busta Move for nothing!). He keeps up well with all of our activity: playing in the back yard and going on nice long walks. Not only that, we think he’s the cutest looking pug out there… we really can’t say enough wonderful things about him! Buster gets along great with our other dog Murphy, they are both happy to have one another. My family and I are just so lucky we found the right pug on our first shot and happy that we were able to get him through such a great organization. Thank you so much for giving our family this gift. We really can say we are complete now.